Honorable mention: "Jersey Joe Walcott" (Arnold Cream), "Marvelous" Marvin Hagler, Renaldo "Mister" Snipes, Michael "Dynamite" Dokes, "The Wild Bull of the Pampas" (Luis Firpo), Bobby "No Dice" Chacon, Rubin "Hurricane" Carter, "The Undertaker" (Harry Wills), "Gentleman" Jim Corbett, "The Boston Tar Baby" (Sam Langford), Jose "Mantequilla" Napoles, "The Black Assassin" (Stanley Ketchel). On Tuesday, Page 2 ran its list of the best boxing nicknames of all-time. We asked for your take, and you filled our mailbag with plenty of opinions. After going through about 400 letters, below is a complete rundown of the Top 10 vote-getters, along with some of the best letters about each nickname. And be sure to vote in the poll at left to choose the all-time best boxing nickname. Forget about the cloud of psychopathic delusion he seems to exist in, the man's early career was brutally legendary. The nickname "Iron" was as simplistic as his style; he didn't need a ring entrance with the production value of a Hollywood blockbuster, just black trunks, black shoes, and intimidation. His method in the ring was just as basic, every movement made with the cunning ferocity of a predator stalking its prey and every punch thrown with bad intentions. Its simple enough, but boy does it fit...like a (boxing) glove. To many, "The Greatest" defined greatness in numerous ways. This man defines the word "greatness." 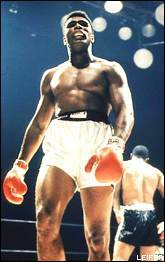 Everything he did (with the exception of fighting for too long) backed up his self-proclamation of being the greatest. At trash talking ... Ali was the greatest, at being an entertainer ... Ali was the greatest, at being an overall showman ... Ali was the greatest. Oh yeah, he was a pretty decent boxer, too. "The Greatest." Because he was. Definitely not one of the best fighters of all-time, but if this list is all about nicknames he's got to be in there. Heck, I don't know his real name and I'd guess 80 percent of the other boxing fans out there don't either. I think one indication of a great moniker is when nobody calls you by your real name -- unless, of course, Butterbean is his given name. In which case I'd like his mother to tell what the future holds for my life. A nickname so good, he legally changed his name. No nickname was more descriptive. One punch from this lightweight and "Boom Boom" out went his opponent's lights. An average boxer with a good punch and a great big heart! All offense and no defense. Mancini would often take three punches in order to throw just one punch. Even more amazing was that he wasn't a particularly one-punch knockout artist. Ray would just Boom Boom you until your heart was worn down. I am shocked that "Bonecrusher" Smith not only failed to make the top 10 but was left off the honorable mentions as well. With a name like "Bonecrusher" you can do whatever you want. No jostling in line, no rudeness from waiters, no bargaining with car salesmen. Bonecrusher gets what Bonecrusher wants. Or else. Just reading the name should make your ribs hurt. How would you feel if a guy named "Sweet Pea" beat you? The way he moved ... and his "ring intelligence" was far better then anyone who has ever fought. He was simply ... "sweet." He made defensive boxing fun to watch. Can you imagine getting your behind kicked by a guy with a nickname like "Sweet Pea"? One of the best pound for pound fighters of all time. He made the middleweight division glamorous again. No longer was it the heavyweights as the only fighters people paid attention to. And, if it weren't for the jobbong he got in the Leonard fight, he'd be an icon. 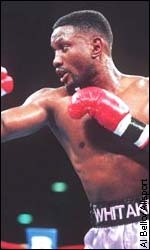 In fact, Leonard went up a division to fight Hagler because that is where the competition was. Without question one of the best boxers of our time. He would fight anyone and everyone. He wanted Leonard so bad he gave into his demands and had the bigger ring and 12 rounds instead of 15. The man changed his legal name to Marvelous for crying out loud, does it get any better than that? There will never be another Hagler. Nothing symbolizes violence, fear and 100 percent business like a hitman. What could be tougher than having the nickname of somebody who is paid to destroy people. Perfect. Yeah, I know he wasn't a real boxer, but so what? It's part of the American vernacular. Hands of Stone is my definite pick, he hits so hard there's a myth in Panama that Duran knocked out a horse by hitting it. I want to correct the Page 2 staff about that stuff that Duran was fearless until his fight with Leonard. In their first fight, Duran hit Leonard like no one hit him in his career. In the second he said "no mas" because Leonard was running around and clowning all over the ring. It closely resembles the truth. When he hit, one knew he was hit, as if by hands made of stone. He was arguably the best pound-for-pound fighter of his era, during a time that boasted some of the greatest fighters of all-time. Who hit harder during the late 1960s early '70s? honorable mention: John "The Beast" Mugabi, "Raging Bull" Jake LaMotta, Mitch "Blood" Green, Hector "Macho" Camacho, Mike "The Body Snatcher" McCallum, James "Lights Out" Toney, Bernard "The Executioner" Hopkins, Vinny "The Pazmanian Devil" Pazienza, Apollo "The Count of Monte Fisto" Creed, and Andrew "Six Heads" Lewis.